Home > Law Books > Practitioner Treatises > Intellectual Property in Commerce, 2019 ed. Intellectual Property in Commerce, 2019 ed. Intellectual Property in Commerce explores the uncertainties of intellectual property law by analyzing four main areas. 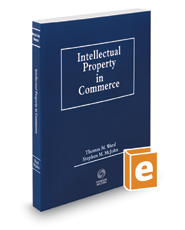 First, the authors examine intellectual property as a commercial asset. Next, they evaluate intellectual property as collateral and how intellectual property law can pose artificial impediments to efficient debt financing for technology-based enterprises. Then, they cover the complexities of foreclosure and creditor realization on intellectual property. Finally, the authors consider bankruptcy issues and their affect on intellectual property assets.